I’m not a religious person, so when I saw the story of the kid in the UK who made $2,550 worth of in-app purchases and then the other kid in the UK who made $1,512 in in-app purchases, I said “There but for the grace of a cold and unforgiving universe go I.” I know that doesn’t make a lot of sense but it’s what I’m left with given my belief system. The point is, I have been there. Yes, I have been victimized by an impulsive grade schooler. [sob] Fortunately, not to the tune of $2,550 or even $1,512. But it was $125 more than I cared for it to be. Which is to say it was $125. Personally, I sucked it up and paid my credit card bill instead of complaining to Apple. Mostly because my damage was lower but, to a lesser degree, because I took it as a “teachable moment”. I mean for me, not for my son. Don’t get me wrong, he’s a great kid who’s very smart, but he’s also very goal-oriented. If he needs the more powerful hero to get through a level in Kingdom Rush, then he’s going to tap every damn available in-app purchase to get it no matter how many weeks of allowance it takes to pay for it. There are, dipshit. Check your settings. I’m sure those British parents were greatful for the pointer. I know I was. Turns out the $125 setting is in Settings under General, and then Restrictions. There you are, you naughty little setting! All of this trouble and the implication that this is a problem for Apple and Apple alone could have been averted by turning Require Password for In-App Purchases to “Immediately”. Personally, I think this setting should ship on rather than off and I’m sure there are other improvements that could be made. 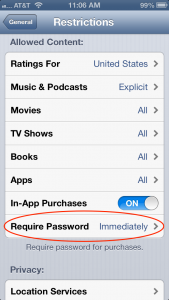 If you’re a parent with an iOS device you let your kid use, though, you should familiarize yourself with the iOS Restrictions settings before handing it to them. You owe it to yourself, your child and your country (and, if you’re British, the Queen). 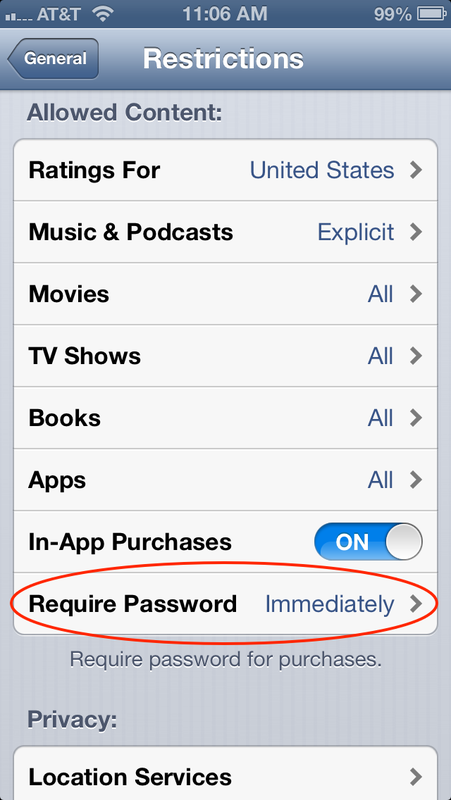 As the “teachable” part of this “moment”, all 948 of our household iOS devices now have this setting on. I also learned that the Google Play Store allows you to set a pin for purchases and activated that on my Nexus 7 (after literally having to let the battery charge for a full day because it had been sitting unused for months). Amazon, meanwhile, has solved the issue by offering FreeTime, an app that creates a restricted “playground” for kids where you can tailor the content and which requires a password for purchases. Microsoft has solved the problem by not having any apps in its store. Ha-ha! That’s a joke. But the five people with Surfaces can take them to the Microsoft Store and have one of the many bored sales staff help them figure it out. Let’s see, did I leave anyone out? Nope, don’t think so.